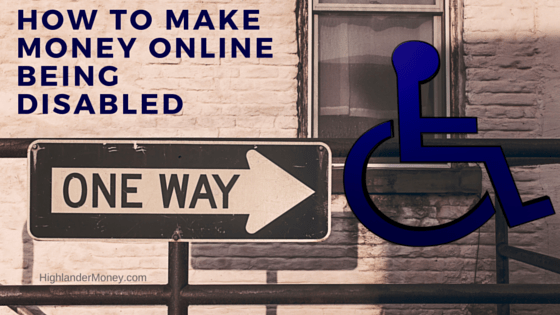 How to make money online disabled? Imagine you need extra cash for a bill or want to buy a new gadget or for groceries but it’s not in your budget, so what do you do? Most people get a second job to supplement their income. Now imagine your disabled and unable to even earn money through a regular job, let alone a second job. Either only relying on a disability check, your family or your personal savings to get you by. You could either be physically disabled or just ill unable to earn money in the long or short term. 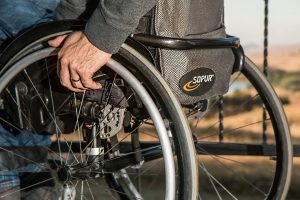 Disabled people have the troublesome problems of dealing with their ailments, and on top of that, they have to deal with the severely limited ability’s to earn money. That most people don’t have to face. Wouldn’t it be nice to be earning money from the comfort of your own home? Well, as long as you are able to type and research online, you can, and will be able to earn money online. Either by blogging, completing surveys, posting to forums, transcriptionist, creating your own websites, or doing GPT (getting paid to). There are many options out there for you to help you earn money to support yourself and giving yourself pride in oneself by working and thereby being your own boss, too. Not all the methods pay the same for your time, but they all pay something to help get you earning. Working, earning money, this will thereby strengthen your self-worth and lead to fulfillment within. People with disabilities don’t have a job to take up most of their day. (8 or 10 hours a day) They can constructively be putting more energy, hard work, and time into creating a business for themselves online. This a true advantage over the competition and a genuinely empowering endeavor to undertake. I believe if disabled people entered into the online world more often they would truly be a force to reckon with. They would have the definite advantage online thereby leveling the playing field and or even having an upper hand, with the amount of time available to them. The world online doesn’t care if your disabled it only see’s what you have created and not your physical limitations. I worry myself someday that I am going to be disabled and unable to work. As I have been diagnosed with a major genetic organ disease, that will vastly affect my energy levels in my future. This is what drives me to establish my businesses before this happens and just maintain my businesses when it does come. I work two jobs now and actively work online to boot. I feel compelled to help others with diseases or disabilities, to help provide knowledge for their financial means. The first method and the most powerful method that I want to share with you is basically blogging and creating a website. Yep, it’s a great earner once you put in the time and work into building it. But well worth it in the long run. I want to be upfront right away, you’re not going to be pulling in money right away, it takes time to establish visitors, content, and sales. How can we do this the fastest and do it right? Well, that’s where Wealthy Affiliate comes into play. To read more about Wealthy Affiliate in my full detailed review click Wealthy Affiliate Review 2016 Legit Money Marker? With the quality training and structure and the support via their community or the owners. Wealthy Affiliate is unmatched in website creation and learning. There is no other program out there like this. Sidenote here, it’s also a great community if you are homebound and unable to leave your resident. A great way to interact with other people in a positive flourishing environment. The people here are AMAZING! That’s what sold me on it, btw. 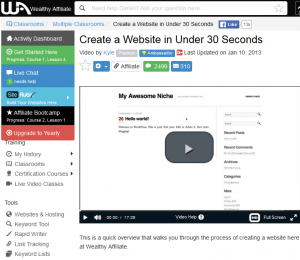 A look inside Wealthy Affiliate and yes, you can create a website in under 30 seconds. Even if you know nothing about creating a website or blogging, Wealthy Affiliate will teach you at your own pace. That’s another great thing about this program, go as fast or as slow as you need. You dictate your speed. You will learn new skills and effectively apply them to your new business of owning a website. If you still have hang-ups about joining Wealthy Affiliate you can read my article on Fears And Concerns of Joining Wealthy Affiliate. They have two programs to choose from a free membership, which is free, duh. Also, a premium membership which is $47.00 a month. But this can be almost cut in half if you pay for a whole year at once. It takes a few months to get your site looking presentable and filled with content that you created. To start earning affiliate commissions that depends on so many factors, but generally, they say 6 to 12 months. What are affiliate commissions? When your site leads a person to make a purchase, you get paid a percentage of that sale. It’s that easy. This method alone can supplement your income significantly, once up and established. If you are looking for more detailed information on methods of earning online, you can click Types Of Jobs Online and also take a look at my Big List Of Online Jobs at the top of every page, that pay decent money. But there are some others as well, along with others I have reviewed which can be found on my site. Some of these could possibly pay the bills the others are to supplement your income and not meant to replace it. You don’t have to be limited to one, I recommend you try them all, see if you like one better than the others and then stick to that one. I hope you have learned how to make money online disabled. It can be complicated at times, but you can also earn a living or just to get extra spending cash. But if you want to create your own website that is profitable while learning and growing in a positive direction, I highly recommend you sign up at Wealthy Affiliate today. If you have any questions or comments, please do so below. Thanks. ‹ Is Simple Income Strategies A Scam?